These vegetable recipes will delight and inspire you. From healthy and easy steamed and roasted vegetables to rich and inviting casseroles and gratins, you're sure to find a recipe in this list. These Brussels sprouts will be an instant hit with your friends and family. 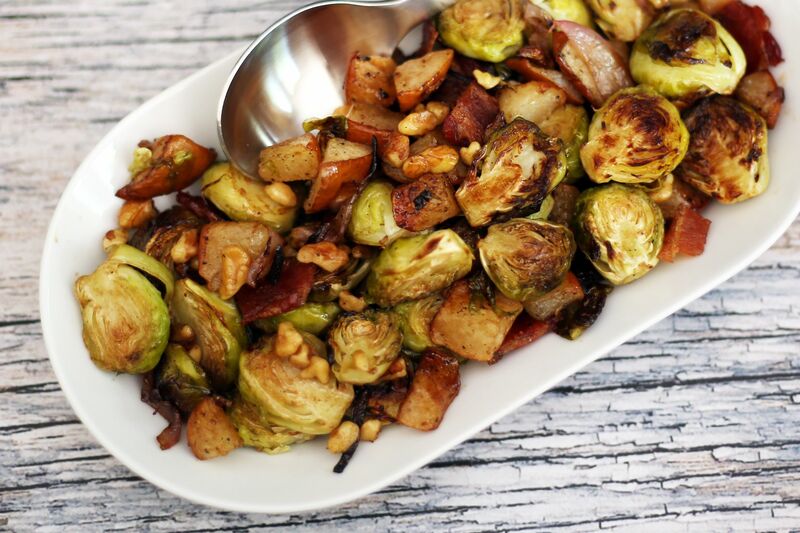 Pears and walnuts complement the sprouts nicely, and bacon gives them fabulous smoky flavor. These cider-glazed sweet potatoes are super easy to prepare, and they go with just about any fall or winter meal. A buttery brown sugar and apple cider glaze make them extra special, perfect for a special dinner or holiday feast. They are an excellent side dish to serve with ham or pork, and they go well with sausages. These fluffy mashed potatoes offer several possible variations, including lighter options and flavor additions. Honey, butter, and brown sugar bring out the natural sweetness in these cooked baby carrots, and lemon juice balances the flavors perfectly. These nicely seasoned carrots are quick and easy to prepare, and they make a great side dish for a big family meal or holiday dinner. A simple white sauce with cheddar cheese brings everything together in this delicious, crumb-topped asparagus casserole. The recipe calls for frozen asparagus, but fresh can be used. Boil or steam the asparagus until just tender and then proceed with the recipe. Frozen spinach makes this creamed spinach dish easy to fix, and Parmesan cheese, a little garlic, and a hint of nutmeg flavors it perfectly! We recommend giving it a try as a side for your next family meal. With their savory dusting of parmesan cheese, garlic powder, salt and pepper, these carrots taste almost more like French fries – and are just as addictive! This is an easy side dish to put together that will go over especially well with children. Brussels sprouts are colorful and delicious with the simple addition of stewed tomatoes. The tomatoes, bell pepper, and seasonings are added to fresh sprouts. This is a surprisingly quick preparation and it makes an excellent side dish with just about any meal. These balsamic and brown sugar glazed beets are easy and tasty with sweet and sour flavor. Fresh beets are simmered with a mixture of brown sugar, butter, and balsamic vinegar. This flavorful broccoli and cauliflower bake is baked with a white sauce and a Parmesan cheese and buttery bread crumb topping. If you want a richer sauce, add some cheese to the white sauce or add cream instead of milk. Zucchini and tomatoes make a winning team this great-tasting side dish. This is an excellent way to use your fresh zucchini, and it's an easy recipe to prepare. Stir fried vegetables are a versatile component in any Southeast Asian meal. They are a great accompaniment for grilled or fried meat or seafood. There are so many ways to cook it and the combination of vegetables is quite limitless. This particular version negates the heavy sauces and, instead, uses a light rice wine to add flavor. These creamed peas are made more flavorful with sliced mushrooms and onion rings. The mushrooms and onions are cooked together and then combined with the roux and sauce mixture. A small amount of nutmeg gives the sauce additional flavor. It's an easy dish, but fancy enough for a Sunday dinner or holiday feast. This is one of those dishes that is extremely simple but extremely flavorful. Serve it and watch people not believe it is seriously just leeks, butter, and salt. It's all about the gentle cooking to coax out the sweet nature of leeks and make them supremely tender. The long cooking lets you use the tougher (and very flavorful) leek greens, so often discarded in cooking. 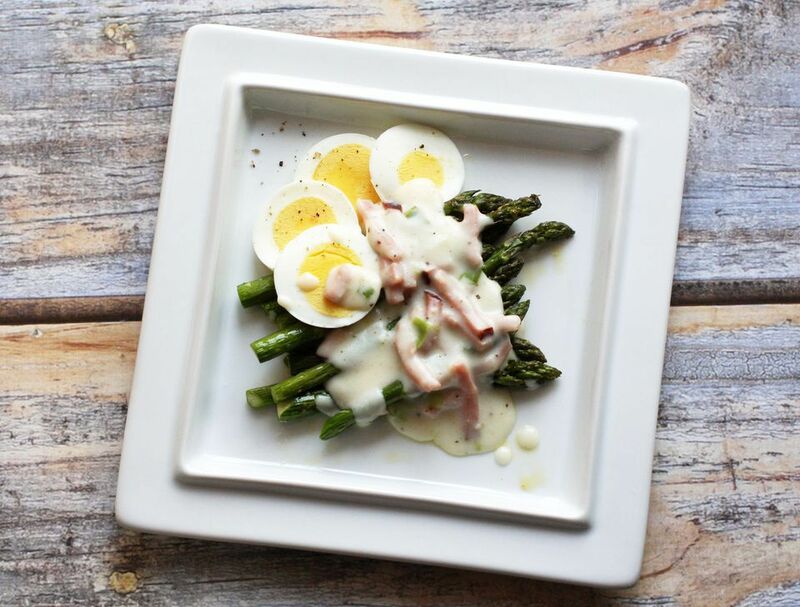 Make this tasty asparagus dish with the simple Dijon-flavored cream sauce or add some sliced hard-boiled eggs and diced ham for a luncheon dish. Spaghetti squash is a fairly large winter squash with a unique texture – when cooked, the flesh separates into strands, which is easily likened to spaghetti. Plenty of people like to put all kinds of sauces on spaghetti squash, as if the strand-like flesh were actual pasta, instead of just pasta-like in shape. Cook this simple spaghetti squash in the oven or microwave. Or use your Instant Pot or pressure cooker. Olive oil and simple seasonings are all you need to make this simple 10-minute asparagus. The green bean casserole has long been a favorite comfort food and it is an essential Thanksgiving side dish. This is a delicious green bean casserole, perfect for a holiday feast or Sunday family dinner. The homemade Cheddar cheese sauce with sour cream and mushrooms is an excellent replacement for the canned condensed soup and it is as it creamy and delicious as the classic Campbell's recipe. If you prefer the soup version, take a look at this classic holiday green bean casserole. Ratatouille is a traditional French dish made of eggplants, tomatoes, and zucchini. It's often served as a side dish with lamb or other meats or poultry — even fish. Served over rice or couscous, it makes a hearty meal. This ratatouille recipe uses zucchini, yellow squash, and toasted pine nuts. These baked leeks melt in your mouth with the creamy, garlic-infused sauce and rich fontina and Parmesan cheese topping. Feel free to use another kind of cheese in the sauce. This Parmesan roasted cauliflower is an excellent way to enjoy fresh cauliflower. The cauliflower is tossed with a savory mixture of garlic and Parmesan cheese and then it is roasted to perfection. Celery is not usually thought of as a main ingredient, but this recipe is a surprisingly delicious exception. The casserole is an excellent way to use an abundance of celery, and it's a dish you'll make again and again. It's time to get excited about broccoli again! This broccoli is roasted to tender perfection with ginger and optional garlic. Serve these fabulous greens with freshly baked cornbread and pepper vinegar sauce. If the thought of preparing fresh artichokes seems intimidating, take a look at this recipe. Here we break down the process of cutting, steaming, and eating artichokes. Do you like your sweet potatoes savory or lightly sweetened and spiced? These sweet potatoes are baked then seasoned with salt and paprika or cinnamon and sugar. Try a southern classic with these fried green tomatoes, served with a tasty Sriracha mayo. Yum! These twice-baked potatoes are a wonderful change of pace from everyday baked potatoes or the "sam-old" mashed potatoes. The potato skins are filled with the savory mashed potato mixture and then the baking continues until the topping is golden brown. This easy grilled eggplant is flavored with a little balsamic vinegar, herbs, and olive oil. This is a no-fuss recipe for grilled eggplant. Feel free to vary the seasonings. This recipe is for basic stewed tomatoes made with fresh tomatoes, salt and pepper, butter, and sugar. Sauté some finely chopped celery, onion, and bell peppers for a zestier, more flavorful dish. Add a few dashes of Tabasco or some red pepper flakes for a little heat. This roasted okra with tomatoes is an excellent way to enjoy the vegetable. It's easy, too. With only 3 ingredients plus salt and pepper, the okra and tomatoes are the stars of the dish. The winning combination of sliced okra and tomatoes makes a delicious side dish for any meal. In this recipe, the okra is sliced, combined with tomatoes, then roasted to perfection with a little olive oil and seasonings. Delicious creamed onions make a nice side dish for holiday dinners. Small white onions or a mixture of small white and purple onions are cooked and served in a classic white sauce flavored with a dash of Cajun seasoning.